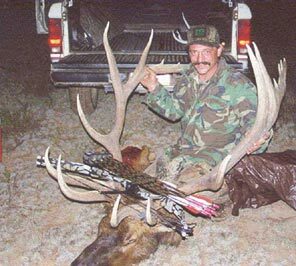 This New Mexico 9×10 Typical bull was taken in Cibola National Forest near Milan New Mexico. This was my first bull bow kill, and a very satisfying one at that. I have hunted New Mexico for 10 years now and have become accustomed to the early mornings and long hikes–a different style of hunting all together for someone from the northeast. We were in quite a drought this year and animals were hard to come by. Many of the natural springs the area had to offer were either dried up or over-run with cattle. The elk’s natural habitat was ever changing due to the ever-growing competition for water. We had scouted several weeks earlier and had found some heavily used areas, but all the sign was a few weeks old. We had spotted several nice mule deer, but had yet to come across any fruitful or promising areas. We planned to hunt the first and last weeks of the scheduled hunt (September 1-20) in order to get in some additional scouting. It was quite warm the first week with temperatures at or above 80 degrees, and little movement. I had moved around to several areas using only a tent for the first week to enable me to break camp easier. The end of the week we had spotted some good areas, but still no elk. We planned to attack the opposite side of the crest on the last week after talking to several ranchers who were familiar with the natural springs in the area. I had brought up my pop-up camper and me and my hunting partners set up camp several miles from our intended hunting area. The first day my partner spotted several cow. I on the other hand was too busy looking for a water source to set up a stalk. The second day we had spotted a large number of turkey along a large meadow, and several black bear, two cow elk, and a number of fresh rubs. We could tell immediately that this area would be promising due to the large number of game in the area. Although we didn’t come across the source of water, it was apparent it had to be close. That evening we tried bugling to prompt some response as the woods came alive. We could hear several bulls in the meadow. Since it was getting to late top start a stalk. we attempted to get a closer view. They were at the edge of the meadow with 15-20 cows tearing up the pine trees in a frenzy. We knew where we would be come next morning. A 5:00 wake-up call, a quick cup of coffee and off to the field. We headed off to where we had last spotted them and attempted a few cow calls. Off in the distance we could hear the bulls faint bugle. we gathered our thoughts, strategized, and broke off for the stalk. We had managed to get within 100 yards of the bulls before daybreak, where they were hidden in a dry stream bed. Inching our way forward we must have spooked them and off they ran. A quarter mile away they held up. We put on an all out assault on the meadow, each one stealthily making their way through the meadow. Once at the meadows edge the herd turned towards the peak, bugling the entire way. I have never heard bulls carry on this much for such a long time. I broke from the group and worked my way up the opposing peak. Amazingly enough I ran into what now could have become a disaster. The mule deer, turkey and bear. First the mule deer spooked towards the herd, over the next rise a flock of turkey and again another mule deer. I thought for sure this would spook our prey. I rested a while, and had a smoke thinking all was lost. I just wanted to get a glimpse of them before they disappeared into the forest. I cow called a few times as the woods came alive. I could see a break up the canyon at last where I might be able to cut off the herd. I broke into the herd all right, right in the middle of them. Fortunately the ground was sandy and a few pinion trees gave me great cover. I had to slither through some scrub oak, but I found my chance. I could hear the lead bull, which had a deep grunt, and could hear the other bulls trailing behind me. Should I wait for the bulls to step up, or go after the herd bull. Spotting a cow at 50 yards. I could see his tines raise above the pinion. I had to take the chance. They were quartering away. I tucked behind the pinion and drew back on my Legend Magnum. I could remember the warning from my partners the night before “Don’t look at his antlers”, but I could help it. I let go of my Easton Gamegetter II XX75, as the bull turned broadside. A dead limb in the way, across his mid section also helped to direct my arrow straight into his lower front shoulder. Excited I went to mark the shot and prepare for the wait, when I could see his massive antlers stretching from the ground. I think my hunting partners thought I got eaten by one of those bears from all the screaming I did. They had given up the chase earlier and were headed back for lunch. Come to find out they had several shots at a smaller 6×6. As the afternoon came, the weather changed abruptly with rain and sleet. This must have been what triggered the bulls to come into rut. The rest of the afternoon (9 hours to be exact) were spent quartering and carrying. We could still hear the other bulls in the distance the rest of the day. Thanks to good hunting partners and for all their hard work we were able to get him out before dark.